I recently heard of a few things that made me really curious and interested in visiting NYC again. 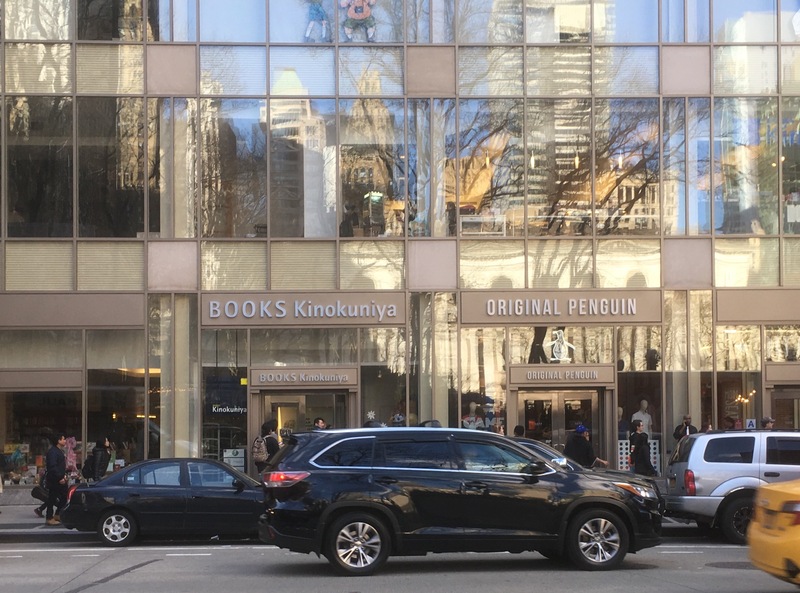 The first thing I had heard about is a Japanese bookstore called Kinokuniya, which apparently has tons of interesting mechanical pencils. I also heard about the opening of a new Redeemer Presbyterian church branch near Lincoln Center, at the southwest corner of Central Park. And to top it all off the Lady Bulldogs are going all the way to the women’s basketball national championship, so what better place to watch them play in their biggest game of all time than with fellow MSU graduates in the city? I am beginning to feel more at home in the city, and I am finding it nice to stop and get to know some of the fixtures and take time to chat with people I run into from time to time. 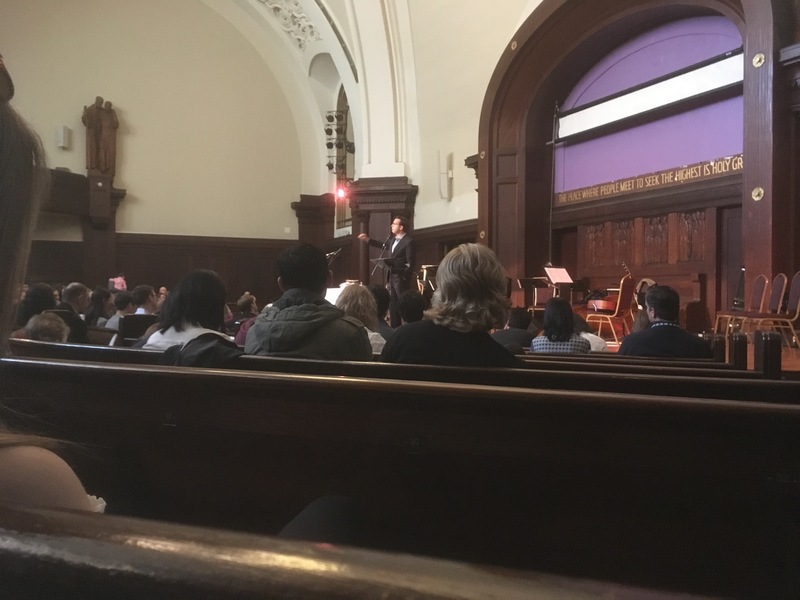 I made it, early in the morning by my standards, to the Center for Ethical Culture where Redeemer Pres Lincoln Center was having its inaugural service. Due to misreading a text, I got there 40 minutes late, but still in time to hear the sermon, which was on the story of Esther and how, even though she was unable to behave exactly as a “good” Israelite or a “good” modern American feminist should, she was still able to persevere and stand up for her people in a difficult time. There was a great evangelism session afterwards, training the new church members in how to effectively witness to their community without being obnoxious or just remaining invisible. The venue is in a great spot, right on the park, and has a great sanctuary, which will certainly serve them well as they seek to expand the ministry of Redeemer Pres, which has recently undergone efforts to try to separate the different locations in the city from each other, to strengthen more of the local bonds that exist and are growing at each location. After church and the training I joined Andrew Macmahan, an architect friend from MSU who lived with me in the MANsion (Rip) for a semester, and his friend Lasseter for lunch at a diner under Andrew’s apartment near Lincoln Square. We talked about some of the architecture that was around us, my experimental physics experiences and career plans, as well as Lasseter’s time at Moody Bible College in Illinois and his time working there and running a startup media and communications firm. We then took the subway over to Bryant Park to visit Kinokunya, which a friend had told me about recently. Once there, Catie Marie Martin joined us and we found a bunch of really cool mechanical pencils. One of the pencils does this interesting thing where every time you press down on the lead it will rotate the lead, keeping the tip rounded off. Another pencil I found pushes out the lead when you shake it, so you don’t have to push it out yourself. Another had a pencil, a black, and a red pen inside it that would come out depending on what orientation you held it. 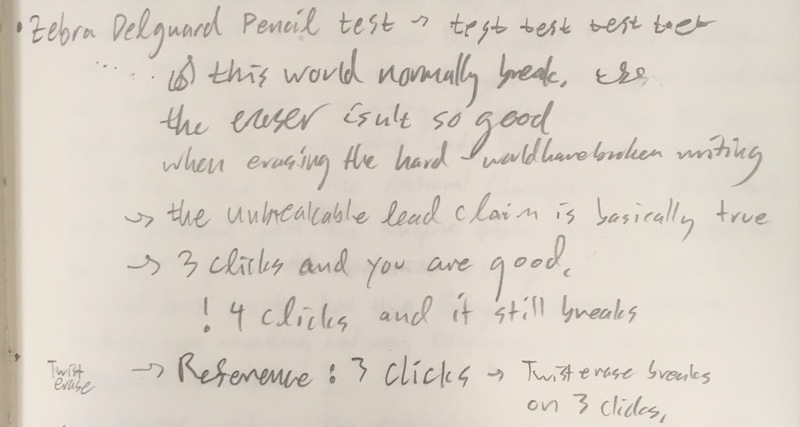 And I bought one that has a spring loaded action that causes the lead to not break under pressure that would otherwise cause it to snap (as demonstrated below in terrible handwriting). A test run comparing the Zebra DelGuard to my trusted Pentel Twist-Erase. The four of us marveled at the novelty Japanese toys and solutions to bizarre problems you didn’t know you had, then went to sit in Bryant Park in the sunny Spring weather. Andrew and I then checked out a small coffee shop and grabbed a sandwich and cookie at a Pret a Manger before walking past the Empire State Building and the 120 year old Armenian Evangelical Church that I went to last Sunday to see Michael and Lisa Gungor perform a live acoustic show that was really touching, both because of their musical skill as well as their commitment to engaging in honest intellectual discourse on skepticism and the many key issues facing Christianity today. 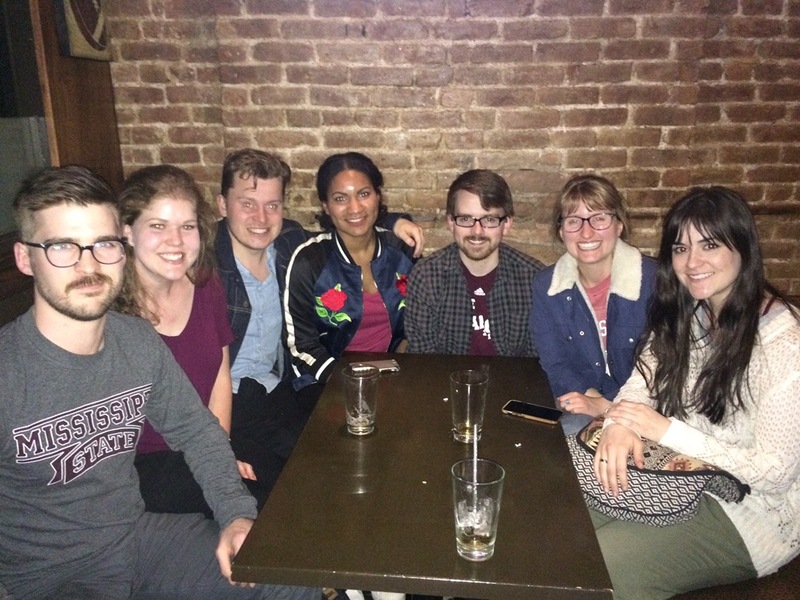 We made it to the Bar 515 on 3rd and 34th street, which is a Mississippi State run place that hosts big MSU watch parties and has some pretty good IPA’s on tap (I got the Sweetwater 420 and the Lagunitas IPA, as well as a humus platter). There were probably 15 other people besides us there to watch the Women’s National Championship basketball game, which was a pretty refreshing experience, after going more than a year without being at any actual games. Although the Bulldogs lost to South Carolina, 55-67, it is still absolutely wonderful that they were able to make it so far, and upset UConn in the process. I then walked the ~ 1 mile back to Penn Station and grabbed a Krispy Kreme donut before they closed. I gave the last of my coins and the remainder of a Starbucks gift card to a man begging for money nearby and proceeded to wait the hour for my train back to Stony Brook. I charged my phone next to this extremely friendly, homeless, black man named Melvin, who I quickly got to talking with about my visit to Redeemer Lincoln Square and the story of Esther. Melvin told me a lot about his life and how he came to be homeless, his struggle with finding housing and run-ins with the law and substances. 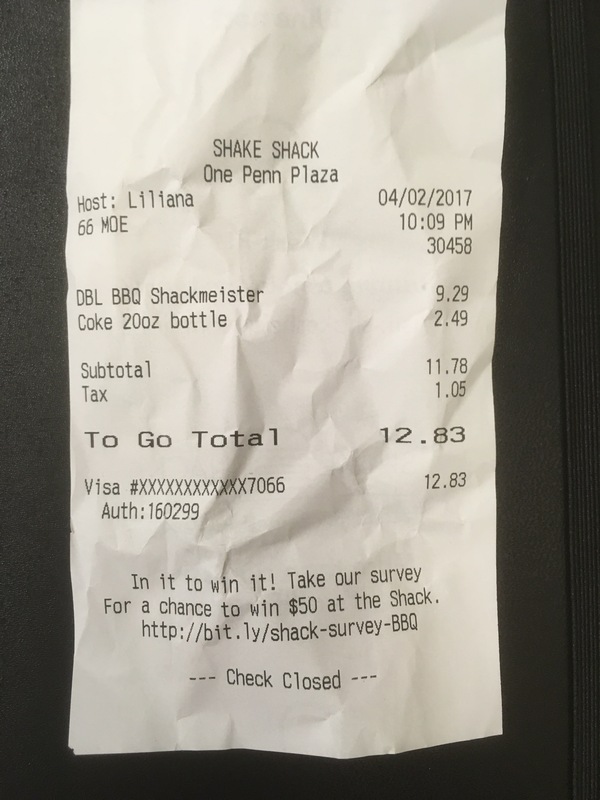 He was a very nice man, and when he got up to leave I was compelled to take him to the Shake Shack right next to the tracks. He accepted my offer, as he had not been able to eat any supper that night, and we had a nice chat about our favorite fast food restaurants. I really hope this was the right thing to do, and that I was able to use my position of privilege to brighten this kind man’s day, even though half of my conversation centered around the cool things I get to do as a scientist who gets paid to live in a nice suburban area and study effectively unapplyable physics for a living and complain about how boring that can be at times. I have no experience really interacting with people significantly less fortunate than myself, but I really hope I can make it a habit to really talk with anyone I come across from now on and try to acknowledge their humanity in some meaningful way. I am including a picture of my receipt, not as evidence of how nice of a person I am or something like that, but rather as evidence of how much it can cost to reach out to someone and how completely clueless I am ($13 was way more than I thought it would be, but I guess that is what you get when you go to the big city) when it comes to actually trying to do something for someone. This is really a request that you, my friend and reader, please engage with me, give me advice on these kinds of things and what I should do in similar situations, and help me to do this sustainably by helping support and facilitate my further visits to the city. My next trip is to New England to visit family for Easter. I go into further detail of my goals and plans for Beyond the Standard in this post, and you can easily support, help guide, and follow me on my Patreon page.